Would you grab the opportunity to nurture a young activist? The future is in good hands. The Australian Youth Climate Coalition, GetUp, The Oaktree Foundation and many other organizations are supported by crowds of enthusiastic young activists. The best activism is supported by meticulous research and motivational stories, and that’s exactly the specialty of the New Internationalist magazine. Can you please help us with a pledge so that we can nurture more young activists? 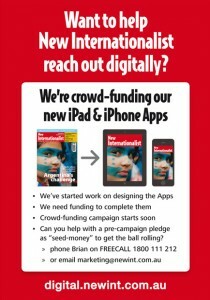 We’ve started work on designing our New Internationalist magazine subscription Apps for iPad and iPhone. They’re super-important for our outreach work, particularly in schools and universities, to ensure the next generation of potential activists have the global justice facts and arguments they need. We need funding to complete the Apps and to ensure they get the distribution they deserve. New Internationalist is soon to launch a crowd-funding campaign. We need seed-money from a bunch of independent media supporters who are prepared to make a pledge on launch day, to give the campaign a strong start so others will be enthused to join in. If you can help with a pre-campaign pledge, please email me now on marketing@newint.com.au and I’ll then let you know when the crowd-funding campaign is launched so you can make your pledge online. This is a tremendously exciting project; probably the most important new venture for us since the Australian launch of the New Internationalist in the 1970s. But for a small not-for-profit Co-op like ours, it’s very demanding. There’s a very long lead-time on generating income from these new high-tech ventures. We need your crowd-funding support to plug that gap. We’re writing the iPad and iPhone Apps in-house, as an extension to the very successful digital.newint.com.au online subscription service we launched earlier this year, also designed and maintained in-house. We’d be delighted to have your support. This entry was posted in Activism, Education, Independent media and tagged activism, Australian Youth Climate Coalition, AYCC, crowd-funding, digital subscription, GetUp, independent media, New Internationalist magazine, Oaktree Foundation by Brian Loffler. Bookmark the permalink. I have subscribed to New Internationalist since the 1970s so of course am aware of the importance of an independent voice.